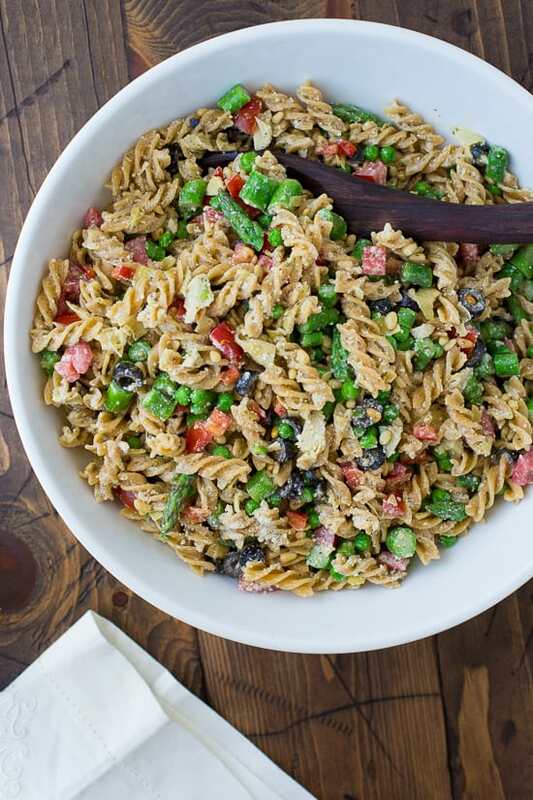 Tuscan Pasta Salad! Everyone always asks for the recipe and there are never any leftovers! So easy to make a full of flavor. 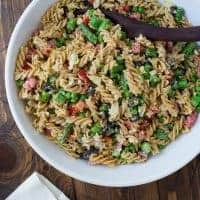 I love pasta salad for BBQs, potlucks or just for dinner on a hot summer night! 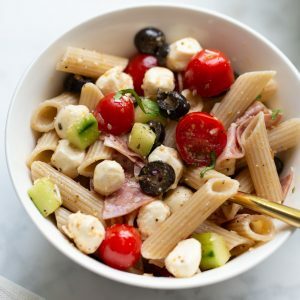 This Tuscan pasta salad is bursting with flavor from kalamata olives and marinated artichokes. 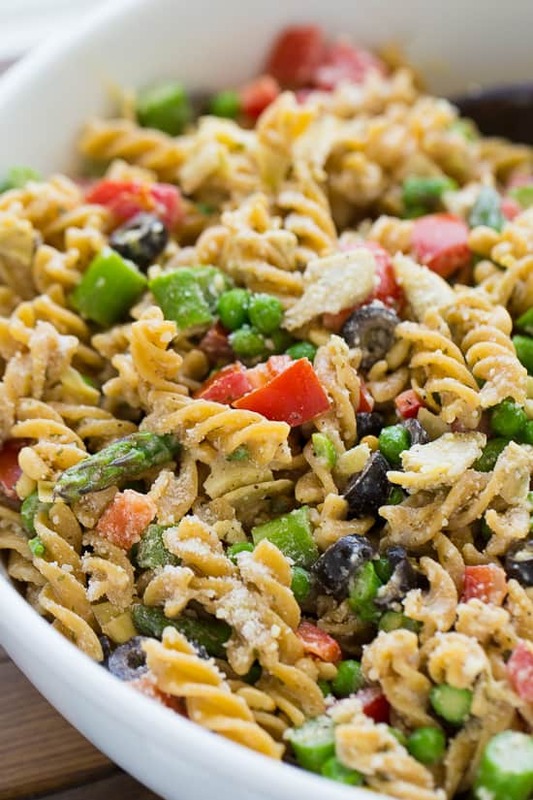 It’s also full of asparagus, tomatoes, peas, and red pepper making it much healthier than your average pasta salad. Everytime I make this pasta salad people ask for the recipe. I’ve recently made it with this gluten-free chickpea fusilli that I found at Costco. It holds up great! 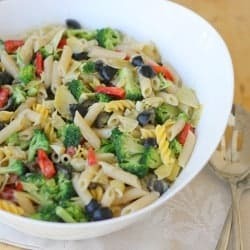 With all vegetables and that high protein pasta this pasta salad is a meal in itself. Feel free to use any gluten-free pasta you have on hand. 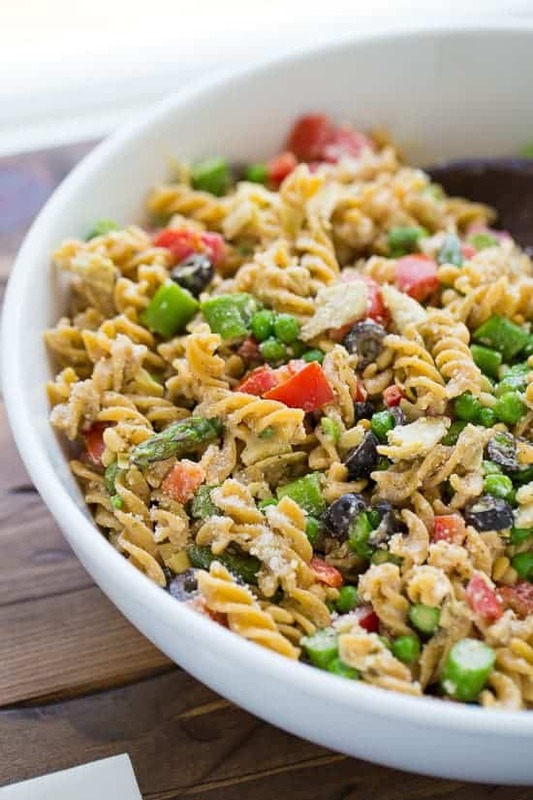 I like topping this pasta salad with pine nuts and a sprinkle of parmesan, but if you want to keep this totally dairy-free use 1/2 the amount of this dairy-free cashew parmesan instead. It turns out great both ways! This pasta salad will keep for a few days in the fridge. You know a recipe is good when you wake up the next morning already thinking about having it for lunch! Update: I’ve made this several times leaving out the red pepper and adding cubed fresh mozzarella and it’s even more delicious! that I found at Costco with good results. Any pasta you like will do! You can also swap out the asparagus for blanched broccoli or green beans. For the dressing: Mix together all the ingredients in a mason jar or small container until smooth and combined. Set aside until ready to use. Cook the gluten-free pasta al dente, according to package instructions. For the asparagus, bring a medium pot of water to boil. Place a large bowl filled with ice water next to the stove. Boil the asparagus for 30 seconds to 1 minute then, using a small colander, scoop into the ice water to cool. Place all the ingredients for the pasta salad, except the pine nuts and parmesan, in a bowl. Toss with 3/4 the dressing. Sprinkle with the pine nuts and paremsan and toss to coat. Chill until ready to serve. Add the rest of the dressing just before serving. Serve topped with extra parmesan. Enjoy! Leftovers will keep for up to 3 days in the fridge. MAKE IT NUT-FREE: Omit the pine nuts. MAKE IT DAIRY-FREE: Use 1/2 cup dairy-free parmesan in place of the 1 cup regular parmesan. Swap out the sour cream for mayonnaise in the dressing. 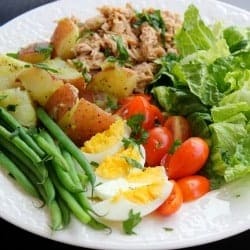 I’ve made pasta salads( usually using brown rice pasta) and they turn to a brick the next day, have you ever had that problem and do you know what might be causing this? This looks delicious, we have a church potluck this weekend, I think we found our dish here. I agree with what Lauren said! Some brands of gluten-free pasta are better than others. I haven’t had great luck with brown rice pasta in pasta salad either. The kind I’ve linked to in the recipe (that I found at Costco) works great! I also think gluten-free pasta salad is best a few hours after it’s made. I would recommend making this the day of an event rather than in advance. However, I had the leftovers for lunch 2 days after making this pasta salad with the chickpea noodles and it was still good! I hope you like it! Those veggies look great! So perfect for summer! What a great pasta dish! Love all the veggies! Perfect for smmer!